^ Abdullah Al-Fawaz; Ralph D Levinson (25 Feb 2010). 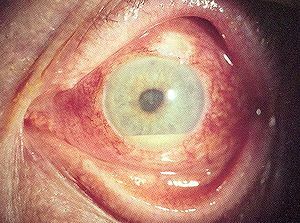 "Uveitis, Anterior, Granulomatous". eMedicine from WebMD. Archived from the original on 4 December 2010. Retrieved 15 December 2010. This page was last edited on 23 April 2019, at 19:53 (UTC).